I have here a fire effect (which looks much better in motion than on a screenshot, promise :)), which is based on an idea that I had a while ago, but never finished. 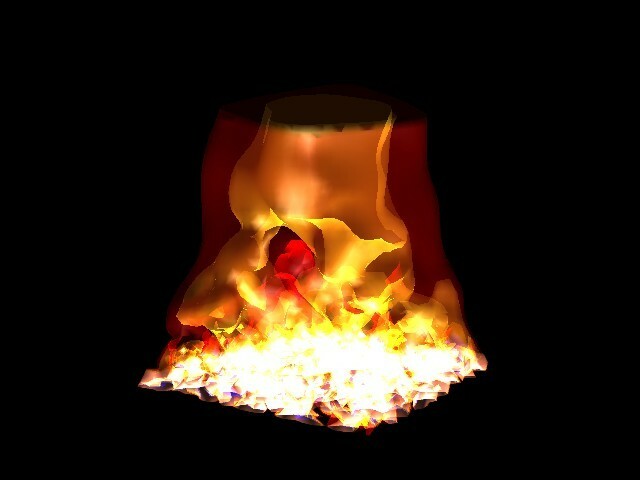 Over the weekend I talked to someone on IRC who wanted to do a 3d fire effect. That reminded me of the idea I once had, and I decided to see if I could finish it, and what the result would be. After pondering how to add proper colouring to it, I decided to go with a very simple idea, which turned out quite well. The fire consists entirely of polygons, so it is truly view-independent/volumetric. It is basically a few different meshes with different colours, that are blended together. I decided to use 4 layers. More layers would probably be too heavy, mostly for the CPU, but the polycount would also get quite high. There are now about 60-80k polys in one frame. You will need Windows, DirectX 9.0b and any videocard that can render 32 bit with alphablending, I suppose. A decent CPU would also be nice, around 2 GHz for a framerate of 50-60 fps.